Nearly half a million native baby sea turtles managed to reach the sea this year from Turkish beaches, Turkey's forestry and water affairs minister told Anadolu Agency on Thursday. Of these 487,136 hatchlings, 227,696 were Turkey's signature Caretta caretta loggerhead turtles, and 259,440 were green turtles (Chelonia mydas), said Veysel Eroğlu. The ministry has counted over 4,000 Caretta caretta nests as a result of conservation work along some 144 kilometers (89 miles) of coastline, along with over 3,200 green turtle nests. Nesting in an appropriate environment is crucially important for turtles, Eroğlu said. There are 21 Caretta caretta nesting spots in the Aegean province of Muğla and the Mediterranean provinces of Antalya, Mersin, Adana, and Hatay, he added. Beaches in Turkey, most famously İztuzu Beach, are popular breeding grounds for loggerheads, but these areas are also under heavy pressure from tourism activities. "Turkey has the highest number of nesting spots in the world," Eroğlu said, adding that his ministry is taking all necessary measures to protect these areas. Both loggerheads and green turtles are classified as endangered species by the International Union for the Conservation of Nature. 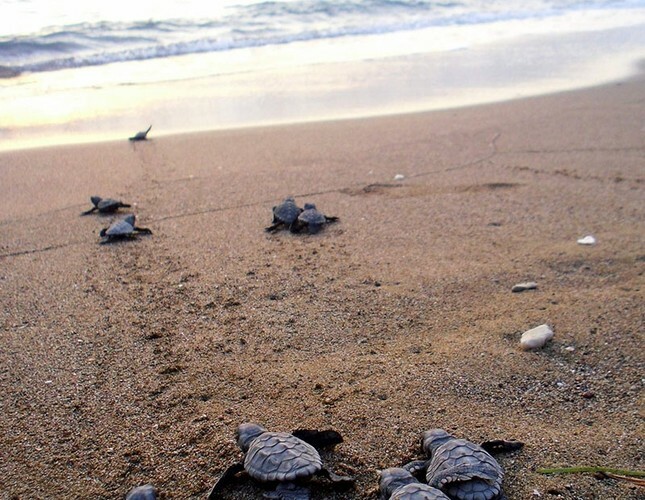 The Muğla-based Sea Turtles Research, Rescue and Rehabilitation Center (DEKAMER) monitors beaches to protect nests during the incubation season and also treats injured turtles. According to the group, loggerheads build their nests about 50-60 centimeters (20-24 inches) deep on the beach, and green turtles, about twice that. After a 45-65-day incubation period, hatchlings try to reach the sea by following the moonlight, but artificial light often confuses them, making them get lost and die. DEKAMER said they built cages around the nests to mark them and as a warning to tourists. Beaches with nests are closed after dark, and sunbeds are banned nearby.